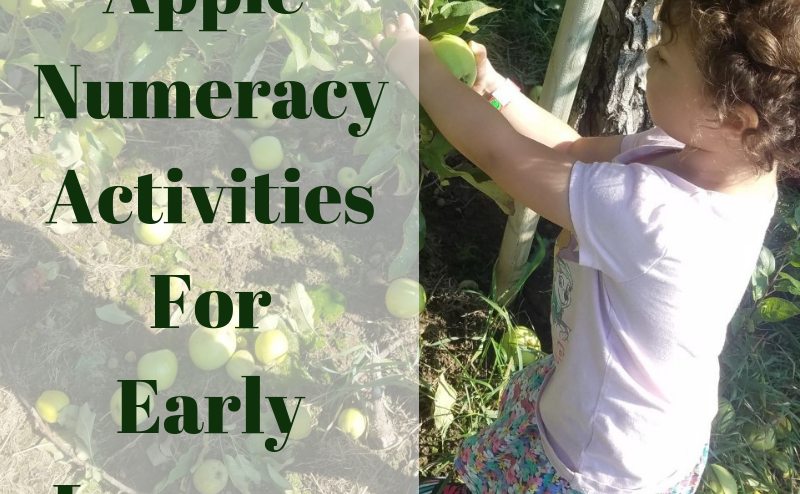 Apples are always a popular fall mini unit, and we had a lot of fun with these great apple themed activities!October has been rather cold, chilly and rainy around here. I’m not a fan of cold nor chilly, although I do enjoy a good summer rain. Fortunately, we’ve had a few nice days where the clouds have separated and the sun has peaked through. On one such day, we decided to take a little jaunt down to Frootogo Farms in Waterdown, Ontario for some apple picking and fall fun! There’s a number of pick your own apple orchards in the Greater Hamilton area, but Frootogo is by far one of our favourites. 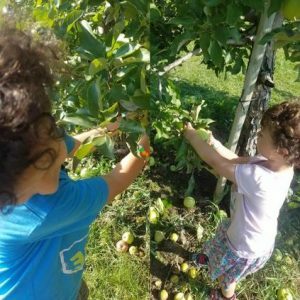 They have an awesome playground filled with kids’ play equipment, farm animals, pick your own apples and pumpkins and an awesome little store with delicious produce and baked goods. Plus, if you go on the weekend, they have a wagon ride, a corn maze and puppet shows! 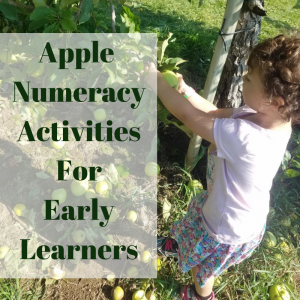 So with our apple picking and farm play day, I decided to find some fun apple themed learning activities to practice some basic numeracy skills. After a bit of Pinterest searching, I printed off my favourites and pulled out my faithful laminator and got to work! 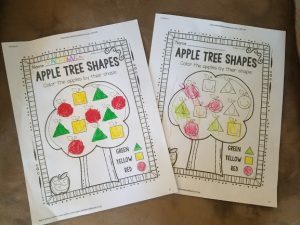 While shapes is a pretty basic concept for my older two at this point, they still had a lot fun with this colour the shape apple tree activity. While they are well versed in colours and shapes, it was a great activity to get them to follow instructions. They (Nathaniel especially) are very focused on being able to “do what they want” and like to take make their own creative licenses. Now, I am all about that 85% of the time, but I do believe in the importance of following instructions. Even though identifying the shapes was a basic review for the kids, I still took a few seconds to do it. I also extended on their knowledge by asking them to identify how they were able to recognize each shape and their unique characteristics. 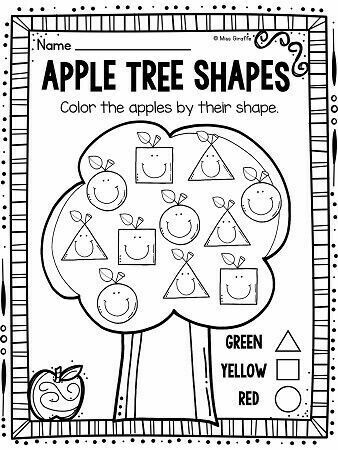 Click here to be directed to the Apple Tree Shape Colouring activity. 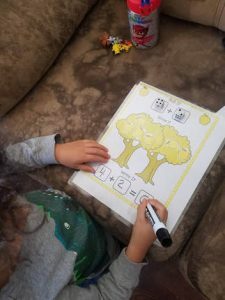 I found this fun Apple Tree Number Matching Game over at Fun Learning for Kids, and my kids absolutely loved it! Sophia is still working on one-to-one number correspondence, and this was a great way for her to practice her skills. Since both kids are obsessed with dice, they had an absolute blast throwing their die down the hall, chasing after it and loudly declaring the number they rolled and this game seriously kept them busy for well over half an hour! I discovered that my printer was running very low on ink, so our tree was made even more festive as it and the apples printed out in yellow! Our final apple themed activity for the day, was one that kept Nathaniel engaged, but lost Sophia after a few minutes. While it is beyond her ability at this point in time, I printed her a copy to play along. She easily did the addition and noticed number patterns, but quickly became frustrated with not being able to write numbers. This was a great reminder to me that I need to work on that fundamental. 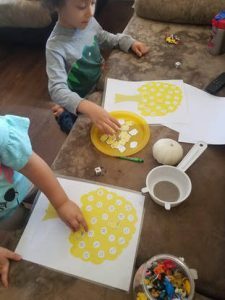 While Sophia was not able to do this independently, Nathaniel absolutely loved this activity! Again, the dice were a great tool and got him really excited about learning. Unfortunately, all of our apples and tree were yellow due to low ink, but it didn’t bother him in the least. He just had fun rolling the dice and adding up his score! I laminated this worksheet to make it into a dry-erase page. That way, Nathaniel could quickly erase each turn and move onto the next one. As we are just coming to the end of October, I’m hoping for another nice day to get out apple picking! Stay tuned for that adventure!